Update on HB3386 – Aggravated Animal Cruelty. I wanted to update each of you on HB3386 – Aggravated Animal Cruelty. Our bill was in the House Agriculture Committee on Tuesday, March 23. There was testimony from two Farm Bureau Insurance Company members – and much of their testimony was the same message as always – laws okay as they are – everything is just fine, and there is no need to change anything. We are members of the greatest organization known to man and therefore, what’s the big deal. That is somewhat a paraphrase, but to view the whole event you can go to www. capitol.tn.gov click on videos, click on house videos , then on Agriculture. The message I tried to convey to the members of the committee was to show the direct correlation between animal abuse and violence towards humans. We all know that animal abuse was the common denominator of many of the youngsters that committed the school shootings where both teachers and students were gunned down over the last decade. In domestic violence situations, many abused will not leave the abuser because they are concerned about the welfare of the family pet. Many who abuse animals often turn to abusing humans. Those of you who have been involved in the long struggle of fighting animal abuse know all the scenarios and can sight the examples much more readily than I can. HB3386 was rolled for one more week so that we could hear from the DAs because much of my reasoning for strengthening our animal abuse laws to a felony stemmed from the many examples of how DAs would not prosecute because it was only a misdemeanor. In talking to the DAs’ lobbyists on the hill (most every special interest but our regular citizens have one), they say it just isn’t so – they always prosecute even when it is only a misdemeanor. We all have stories to the contrary here. Our bill was dealt a fatal blow yesterday when I received a letter from the Senate sponsor, Sen. Bill Ketron (R) Murfreesboro. He advised me that he was placing the Senate bill (companion to HB3386) in General Sub which is akin to the black hole for the remainder of the session. This, in essence, means the bill is dead – without a Senate sponsor our HB3386 can move no further in the process. What I would like to ask each of you as you go about your daily lives of advocating for our animals is over the next year, please document each instance of animal abuse you encounter, and advise me so that we can put together real instances in real time. This way, when I return to Capitol Hill next January, I promise you I will again introduce a bill that will make aggravated animal abuse apply to all animals. We need these examples to strengthen our position that this law is very much needed. This is very disappointing but not unexpected. In my years in public service, both in the Metro Council and the General Assembly, I have seen many worthwhile causes that have to be brought back year after year before there has been enough education on the importance of changing the law – this one is no different. I think each of you can feel very proud that we got our message out that Farm Bureau Insurance Company’s policies don’t represent everyone that is their member, and we have at least made a small dent in their armor by exposing them for what they are – the 800 lb. gorilla on Capitol Hill that so many of my colleagues fear more than any other special interest. Please let’s stay in touch and start documenting each and every instance when we know that a stronger penalty could have made a difference in the final outcome. I feel very blessed to have either met or been able to communicate with each of you, and we aren’t finished yet. This bill will add all animals to our current Aggravated Animal Cruelty statute. It will make the withholding of food and water from ANY animal to the point of death or near death a felony. Currently, if you starve a companion animal it is a felony, if you starve “livestock” it is a misdemeanor. It makes no sense to have different penalties for the same despicable action. How can we continue to say it is far worse to starve a dog than to starve a horse? The bill also defines aggravated animal cruelty as an act committed by a person who without justifiable purpose, kills or intentionally causes serious bodily injury to any animal in a depraved or sadistic manner. The illustration that I have given before is the man who got mad at his wife, tied her horse to the back of his truck and dragged it until it was almost dead, then finished it off by stabbing it with a pitchfork. I think you will agree that was depraved and sadistic. When she went to the DA in her county to ask for him to be prosecuted, she was met with the response that he had too many other cases to busy himself with this one because it was only a misdemeanor. We need stiffer penalties to encourage DA’s to prosecute. They are more likely to prosecute a felony than a misdemeanor. Our bill was in House Agriculture Committee last Tuesday morning. Many of you know that our biggest opponent is Farm Bureau Insurance Company. The Farm Bureau Insurance Agents filled all the seats in the committee room and those of you who took time from your busy schedules to come to the Capitol to make your support for the bill known, were left standing in the aisles. I really appreciate the way you hung in there for over an hour before our bill was heard. We had three great speakers – Sgt. Mike McLerran – Sumner County Animal Control who made great points – he gets several complaints per month about abused horses. It is not the legitimate TN farmer where he has to remove starving horses, it is the horse trader, the broker, the killer that buys horses cheap and refuses to invest any money in their care even FOOD, knowing that many of them will not make it and transporting those who do live inhumanely to Mexico to be slaughtered inhumanely. He was asked by Rep. Eddie Bass (D) Giles County, if in a tight budget year, should the legislature be focused on protecting children or animals. Sgt McLerran very eloquently answered that it was often the people who abuse animals that also abuse children. Our second speaker was Ron Smith, CEO, Electric Service Credit Union, a horse and burro owner and Farm Bureau member. Ron stressed more than once that increasing the penalty would make someone think twice if they knew they were going to be charged with felony rather than having their hand slapped with a misdemeanor. Ron was asked by Deputy Speaker Steve McDanel (R) Parkers Crossroads, if he supported horse slaughter to which Ron answered no. Farm Bureau Insurance Company is for horse slaughter in Tennessee – won’t that make for a great economic and community development tool for recruiting new business to Tennessee. Come to Tennessee, home of horse slaughter. Third, was Mary Hord, cattle producer and equine rescue – also a Farm Bureau member. She advocated for increased penalties and was quite emphatic that she was ashamed to be a Farm Bureau member and that they did not speak for her as they claimed to speak for all 650,000 members of Farm Bureau Insurance Company. Our bill was deferred to Tuesday, March 23rd, at 9:00 a.m. I expect there to be some discussion this week since the cameras probably will not be present again. Please join me if you can make it, if not, please make calls again to members of the Ag Committee. I have been invited to appear on Morning Line – Channel 5+ on Monday morning, March 22nd, from 8-9 a.m. along with someone from Farm Bureau Insurance Company. Please call in if you can at 737-7587. As they stacked the committee room last week, we probably can expect those opposed to increasing penalties to monopolize the phone lines on Monday. I will leave you with this thought – it is a felony to sell glue for unlawful purpose, it is a felony to write worthless checks ($501-$999) and it is a felony to file a false or fraudulent insurance claim, however, it is a misdemeanor to commit aggravated animal cruelty which includes starving livestock or dragging a horse to its death. 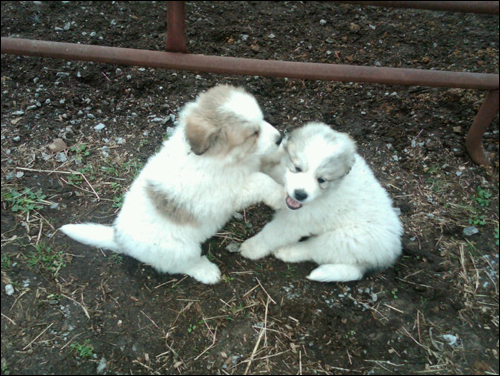 Here’s the description of these cute little guys…They are both males and 7 wks old (per my vet) and look to be pure Pyrenees (they can have markings when young that fade) or a Pyrenees cross. They have had their 1st puppy shot on March 8, wormed withStrongid on March 11, had a Sentinel tablet (for worms and fleas) and have Frontline Plus on them.. I am just a “flea freak” and hate fleas—-the pups did not have fleas—we don’t want fleas!! They are SMART!!! 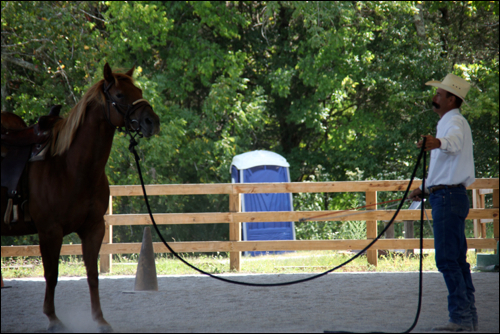 Come when called, “get back” when told to and now, I go to the horse trailer and they get up in it by themselves. I put them in the 4 horse trailer when I go to work so they will be safe. I just love them. I do not need them but would love to keep them. But if I can get a good stable home for them, I will let them go. You can comment here or drop an email to avalonfarms@hughes.net and I’ll pass it along to the owner. She’s love to find a forever home for them…is that you? I spent the morning watching democracy (I think) on capitol hill. Rep. Janice Sontany introduced HB 3386 to the agriculture committee. Actually I don’t know how she and others do this kind of work because it’s like watching paint dry. The first few hours waiting for her bill to come up, we heard about a bill to ban “Terminator seed” corn. Representatives spoke from big companies like Monsanto and Dupont. A long free exchange took place with committee members asking questions, making comments etc. Then it was time for HB3386. The bill would make it a felony to starve or withhold water from horses and other farm animals. Seems like a no brainer doesn’t it? Who would want to stand in the way of protecting these innocent animals and why? The case of the 84 starving horses from cannon county brought media attention to a problem in Tennessee. A state representative, Janis Sontany, went down to see the horses when they were at the fairgrounds. She met with the humane society folks and promised to try and help. She wrote a bill to increase the penalty from a misdemeanor to a felony for anyone doing such things to their animals. Farm Bureau Insurance is against her bill and packed the room with agents from around the state. So here’s the picture: a bunch of guys sitting in all the chairs in the room and all the women including me (& a few men) supporting the bill, left standing in the aisles. The committee for the most part is against the bill too. 3 outside people spoke in favor of it (very eloquently) and were told before they walked up to the podium to “keep it brief.” (a sheriff, a rescue person & a rancher) In an effort to discredit one of the speakers a committee member asked one guy if he supported horse slaughter. (I guess if you don’t that makes you an “animal rights activist.” Is that a bad thing BTW? Oh a straw man question was also thrown out…”would you like to protect farm animals or children?” Well sir, I’d like to do BOTH! Standing silent through all this was quite a challenge. After the 3 speakers the bill was put off until next week. 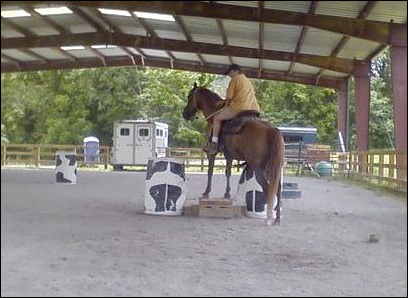 It’s going to take people to get involved in this fight to help stop abuse of horses in Tennessee. So why is Farm Bureau so opposed to the bill? I spoke with several agents outside in the hallway and here’s what I heard. One guy said he owns a backhoe and buries dead horses “all the time,” that people couldn’t afford to feed. He doesn’t think those people should be made criminals. It should be noted that the Farm Bureau Ins company does support horse slaughter and that was banned in Tennessee last year. Apparently that issue “isn’t dead” and a new bill may be coming up again for that too. I’d love to see if anybody connected with any new horse slaughter bills would stand to gain $$$ by a bill like that passing again. 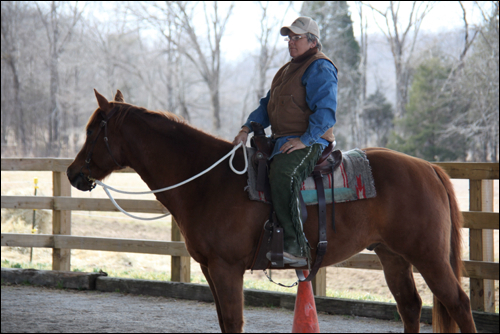 Follow the money…money and horses in Tennessee have a shady history. That’s true when there’s a lot of money involved anywhere. No different in this case. Another Farm Bureau agent said he thinks farmers are being threatened by animal lovers that never stepped foot on a farm. Almost everyone I saw there supporting HB3386 have horses and farms. Most of the people I met at the fairgrounds volunteering to help with the rescued horses were horse owners themselves, owned farms and/or worked in the horse industry. We don’t want to stop farmers from earning a living. We want to stop greedy horse brokers that buy dozens of horses cheap in the hope they can make money on the best of the lot. The rest, too weak, skinny or sick to sell get put on private acreage to die. There are a few ignorant back yard horse owners but the main problem i think are these brokers, traders if you will. Horses are a thing to sell like a car. Well, they are not a “thing.” They are a living being and they feel pain and suffer. Tennessee law looks the other way and at the most will slap an occasional wrist. That’s wrong and if that stays the case, then Tennessee is not the “horse country” I thought it was. We can do better. Rep. Sontany can’t go up against these guys alone. She’s offered to step in front of the parade but it’s up to all of us to fall in and march. If you make a living in the Tennessee horse industry now would be a good time to call Janis Sontany’s office and offer to help. Anyone else too…Farm Bureau associate members speak out. The Farm Bureau Ins company is saying “they represent thousands of members.” Have they ask you how you feel about this issue? These magnificent animals have no voice unless we lend them ours. Call the people on the agriculture committee and tell them to support HB3386. Call the Farm Bureau Insurance Company and tell them (if you’re a member) that they don’t represent your views on this issue. On February 9, 2010, the Federation Equestre Internationale (FEI) met to discuss the use of the highly controversial technique known as “rollkur.” Parelli was proud to contribute to the global initiative to stop rollkur, and we thank all of you who responded to our call to sign and spread the petitions in opposition of this abusive training method. Thank you again for your support! Due to the protests of horse-lovers worldwide, the horse world has taken a huge step in the right direction.